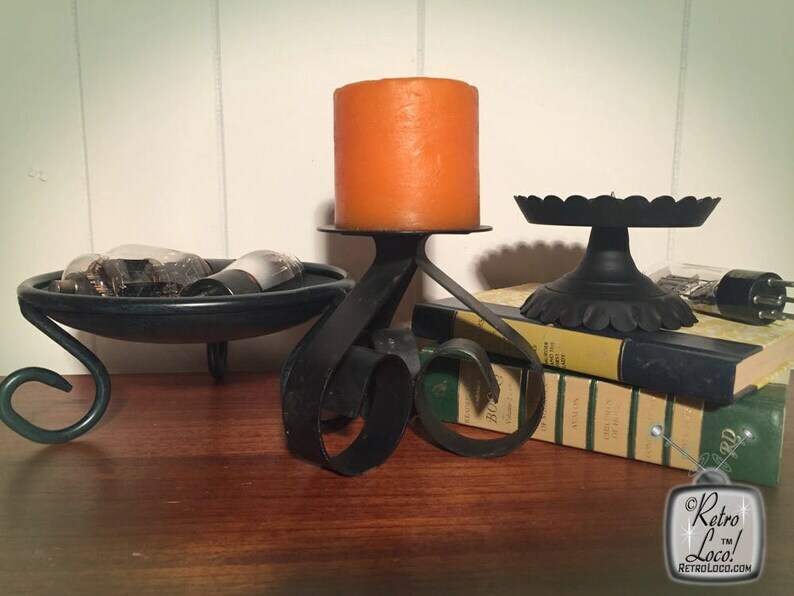 1970's Spanish-style black wrought iron pillar candle holders. Has a spike in the middle to hold a wide pillar candle in place. It is concave so it will catch the candle wax as the candle drips. Perfect for Halloween! If you don't like the black color, you can paint them. They would look pretty painted a shabby chic style. You will receive all 3 candleholders and the orange candle. Books and other props not included. ❉ What you will receive: Three wrought iron candleholders. ❉ Size: Approximately 3 1/2" tall. 7 1/2" across. (Other measurements will be listed SOON). ❉ Condition: In great condition. The smallest one has some candle wax on it. I was not able to remove the orange candle without damaging it, so it will be included also. ❉ QUESTIONS: If you have any questions about an item that have not been answered here or in "Frequently asked questions" below, please contact me before purchasing.